This Rocket Cookstove Is Hot Stuff! If you search the web, you will learn that humans began to cook their food with fire a long time ago. Indeed, you might expect that there would be nothing new in the world of flame-based cookery. Fortunately [Bongodrummer] didn’t get that particular memo, because he’s created a rather unusual rocket stove griddle that is capable of cooking a significant quantity of food. A rocket stove is designed to achieve as efficient use of energy as possible by achieving the most complete burn of high surface area fuel. It features a small combustion area and a chimney with supplementary air feed to ensure that exhaust gasses also burn. This one feeds all those hot gasses directly to the griddle, before taking them away up a pair of flues. As an added bonus there is a dome attachment for a pizza oven, made when a previous project had some left-over building material. Take a look at the comprehensive build video below the break. Perhaps alarmingly the combustion chamber and chimney are made from a gas cylinder, but the use of a central heating radiator for the griddle is an extremely good idea. A vortex air inlet at the bottom and a secondary air injector further up the chimney complete the unit, making for a worthy replacement for a traditional barbecue. It’s worth saying, this isn’t the first rocket stove we’ve seen, there was this simple design as well as this very well engineered space heater. In the summer of 1929, it would probably have been hard for the average Joe to imagine the degree to which his life was about to change. In October of that year, the US stock market tumbled, which in concert with myriad economic factors kicked off the Great Depression, a worldwide economic disaster that would send ripples through history to this very day. At its heart, the Depression was about a loss of confidence, manifested in bank failures, foreclosures, unemployment, and extreme austerity. People were thrust into situations for which they were ill-prepared, and if they were going to survive, they needed to adapt and do what they could with what they had on hand. In short, they needed to hack their way out of the Depression. One reaction to the change in the social contract in the 1930s was increased vagrancy. While homelessness was certainly thrust upon some people by circumstances – in the depth of the Depression in 1933, something like 25% of men were unemployed, after all – life on the road was clearly a choice for millions. A typical story was that of the bored teenage boy, facing no prospects for a job and wishing to relieve his large family of the burden of one more mouth to feed. Hitting the road with a few possessions in his “bindle,” he learned the craft of life on the road from more experienced vagrants. And thus another hobo was created. The popular image of the hobos as unique to the Depression is a little awry. Economic upheaval certainly swelled their ranks, but in America, hobos had first appeared after the Civil War, with war-weary veterans riding the rails looking for work. By the time the Depression hit, there was an extensive hobo culture in the United States, complete with its own slang and a rough code of ethics. Hobos were top of the heap in the vagrant hierarchy, the “knights of the road.” They were migrant workers, generally unskilled, willing to stay in one place for a paying job but unwilling to commit to settling down. When the job was done or he had made enough money, he moved on. Tramps were the next step down – wanderers who were willing to work but only when absolutely necessary. Lowest in the pecking order were the bums who stayed put and relied on the kindness of strangers for their survival. Regardless of rank, all the vagrants had one thing in common – the road. More or less constantly on the move, they had to quickly learn how to provide for themselves without the creature comforts, which before the Depression hit had begun to include many modern conveniences. Cooking arrangements were one thing hobos excelled at, whether on the road or in one of the many hobo camps, or jungles, that sprung up at railroad crossings outside of towns. A campfire in a ring of rocks is the traditional view of outdoor cookery, but the hobos quickly learned that it’s not terribly fuel-efficient. One solution to this problem was the hobo stove, an ancestor of the rocket stove. 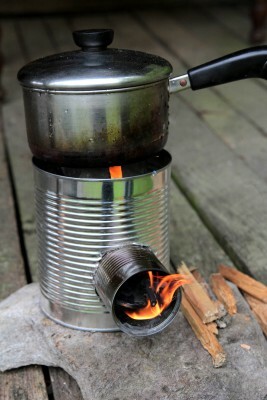 Relying on convection to draw a huge volume of air into a combustion chamber, hobo stoves were easily fabricated from tin cans and other metal scraps that were easy to come by in a world before recycling and large municipal landfills. Most were assembled on the spot and served for a meal or two before being abandoned, but some actually had insulation between double walls and clever arrangements of the fuel shelf to feed automatically as the fuel burned away. Scraps of wood, pinecones, newspapers and cardboard – a hobo stove will eat almost anything, and burn hot enough that even damp fuel isn’t a problem. Often finding himself with time on his hands, many a hobo kept himself busy with arts and crafts projects in camp. Making hobo nickels was a popular way to pass the time, and often resulted in a trade item far more valuable than the base value of the starting material. The Indian head figure on the US Buffalo nickels of the day were modified with tools fabricated from old nails and files; metal was pushed around the coin to create features on the figure, usually a bowler hat and facial hair. A ‘bo could trade the miniature bas-relief sculpture for a good meal; today genuine hobo nickels from the Depression era command high prices from collectors. Unless the hobo was flopping in town or at a really well-equipped jungle, chances are pretty good he wasn’t listening to the radio too much. From our 21st century outlook, it’s sometimes hard to appreciate how new and exciting radio was and the impact it had on everyday life in America during the Depression. Radio connected the nation in a way no other medium ever had. That the Depression did not kill this infant technology in its cradle is a testament to both its power as a medium – families would stop making payments on almost everything else so they could keep their radio sets – and to the tenacity of early electronics hobbyists, who learned to keep radios alive and even to fabricate them from almost nothing. Although tube-type superheterodyne receivers were widely available all through the Depression, crystal sets were still a popular and sometimes necessary hacker project during the Depression. Relying on nothing more than a tuned circuit and a detector connected to an antenna and high-impedance headphones, a crystal set was able to pick up strong AM broadcasts and sometimes even shortwave stations. The earliest detectors were crystals of galena probed by a tiny “cat’s whisker” wire, but metal oxides could also form the necessary rectifying junction, leading to detectors built out of razor blades and safety pins. Crystal radio skills would serve many a Depression-era farm boy well during the next decade as they went off to war in Europe and the Pacific; there they created foxhole radios to listen in on broadcasts without the risk of a more sophisticated radio set, whose local oscillator could be detected by the enemy. Receivers weren’t the only area in which Depression-era hackers made an impact. As commercial broadcasting took off, so did amateur radio, and few commercial transmitters were available to satisfy the burgeoning ham market. Depression-era hams had to home-brew almost everything and came up with some beautiful designs that modern glowbug hams recreate with loving attention to detail. A popular transmitter back in the day was based on the Hartley oscillator (PDF link). Using only a single triode tube and a tuned circuit with coils wound from 1/4″ copper tubing, Hartley transmitters could be built on a literal breadboard from scraps and widely available parts. Tuned to the 40- or 80-meter band, or even down to the 160-meter band, a Hartley or the closely related Tuned-Not-Tuned (TNT) or Tune-Plate-Tuned-Grid (TPTG) continuous-wave (CW) transmitters could put out enough power to work coast-to-coast contacts, or QSOs. Modern hams pay homage to the Depression-era pioneers of amateur radio with regular “QSO Parties” using replica Hartleys – most with bypass capacitors to keep the lethal voltages their forebears had to deal with off the coils. The Great Depression lasted through the 1930s in America, finally dissipating just before the country mobilized for World War II. With factories suddenly working beyond capacity to supply the war effort, unemployment figures quickly plummeted, and the austere practices of the Depression were generally rolled back. Hobo culture declined and amateur radio was shut down by the federal government for the duration of the war, but neither the war effort nor full employment could kill the hobo spirit — modern hobos still ply the rails to this day. And the skills and mindsets developed by Depression-era social and electronics hackers paved the way for a lot of what was to come in the post-war years. [Gregory] uses a rocket stove for heating when it’s cold outside. He’s been trying out all kinds of different materials as fuel when the idea of making his own briquettes from waste materials came to mind. Obviously the project works. As you can see in the image above, he has just formed a lump of fuel using a mixture of newspaper pulp and sawdust. The orange device with the ax handle seen in the background is his own creation. You can see the device in action in the video after the break. In the video comments he also links to a CAD file if you’re interested in building your own. If it’s a rocket stove you’re interested in there’s always the option of building your own. [Simon], a gardener in the United Kingdom, created this super cheap and easy to build rocket stove. The great thing about this little guy is that the methods and materials used to create it are so basic, anyone should be able to quickly make their own for just a few bucks. If nothing else, this is a good introductory project for people wanting to experiment with these stoves. The only materials required are a metal 5 gallon cooking oil drum, a few scrap pieces of chimney liner pipe, and some sand. That’s it. [Simon] cut off the top of the oil drum and made a hole in the front to fit the pipe. He then trimmed the scrap pieces of pipe to form a 90 degree elbow and positioned that in place inside the drum. Sand poured around the pipe acted as the insulator. Finally, he cut and flattened a scrap piece of pipe to use as a front loading tray for the wood. Simple as that. Party on. 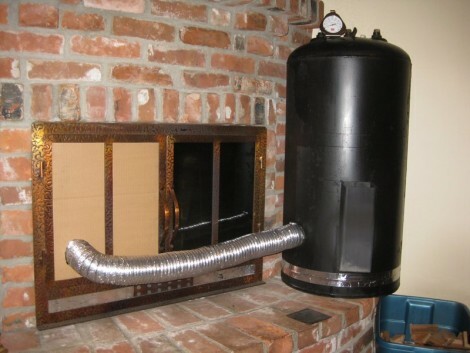 Dabbling in alternative heating technology, [Rob Steves] built a wood stove to dispose of his scrap wood while negating his home’s fire insurance at the same time. As the leftover bits from his wood projects started to stack up he wondered how he would dispose of them. Burning the bits for heat means he’s using every last bit of the lumber. The internal tank from an electric water heater was repurposed as a combustion chamber, with exhaust gases escaping through some high-temperature flexible tubing. The glass panes were removed from one of the fireplace doors to give the off-gases a place to go. The result is a rocket stove that burns very hot and does a great job of warming his house. It’s not the safest way to heat a home, and there may be coding issues with your municipality. But this might go well in a remote location, like that cabin where you have to generate your own electricity.